1 of 4 Heat oven to 400 degrees . Coat a 13 x 9 x 2-inch baking dish with nonstick cooking spray. 2 of 4 In a large bowl, combine muffin mix, corn, eggs, milk, chili powder, cumin and 1 cup of the cheese. Spoon into prepared baking dish. Bake at 400 degrees for 20 minutes. 3 of 4 Pierce casserole with a small knife in about 12 places and spread enchilada sauce over top. 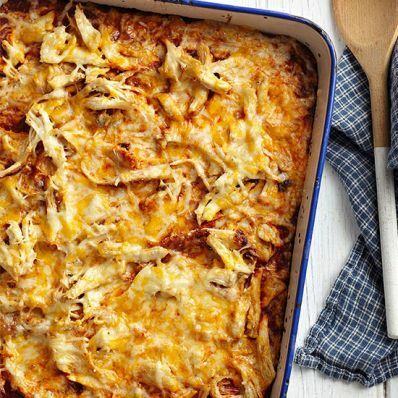 Scatter chicken and remaining cup of cheese over casserole; bake for 20 additional minutes. 4 of 4 Allow to cool for 10 minutes and cut into 8 squares. If desired, serve with sour cream and lime wedges. Per Serving: 780 mg sodium, 27 g pro., 1 g fiber, 36 g carb., 9 g sat. fat, 128 mg chol., 20 g Fat, total, 415 kcal cal.